A great camping spot last night with a lovely warm fire. The days are warm enough but the nights are quite chilly and so the fire is a welcome addition to the campsite. It’s so relaxing and peaceful to sit in front of the fire and contemplate life. Nothing to hear but the sound of the campfire crackling, a ring top being pulled off a stubbie (or 2) and the sizzle of sausages on the Weber. Ah, this is the life. So, after a bit of wind during the night and an early night (funny how the peacefulness and the campfire induce sleep so early in the night), we packed up camp and headed off to Quilpie then to Windorah. Today, we truly saw the land of change as we travelled through a variety of landscapes in the space of 7 hours. Red soil with plenty of mulga scrub gave way to a more rocky landscape. Its hard to see livestock surviving out here though we did see plenty of cattle and sheep along the way. The landscape became almost post-apocalyptic as we saw dead trees as far as the eye could see with little to no undergrowth. Finally started to see the odd emu here and there as well as a pair of brolga’s. Emu’s seem to be few and far between but with the recent rains, it seems that most are able to stay well off the roads as there is more pick available to them. In comparison to recent trips, there was relatively little dead wildlife on the roads. We passed through some huge cattle stations including Haddon Downs. Testament to their hard work was the pasteurised land where we could see healthy cattle wandering around in wide open paddocks not fenced off to the highway. QUILPIE was a welcome tea break. We were definitely in 4WD country as 4WD’s lined the streets of Quilpie all stopping for a smoko break in this lovely little town. We made an assumption that most of these 4WD’s towing their camper trailers and caravans were most probably heading off to the Big Red Bash. It was great to see this many people stopped to support the local businesses who do it tough in this part of the country. Again, we make it a point to shop locally wherever we are to inject some funds into local communities. We stopped at the Quilpie Butchers and were delighted to see they sold ‘paddock to plate’ meat products – beautiful meat and the prices were reasonable too. Had a lovely chat with the owner and the staff. This is what we love about travelling around our country in our camper trailer – stopping to meet and chat with the locals. After lunch in a pretty park at Quilpie, we continued driving on to our next free camp at Cooper’s Creek, Windorah. 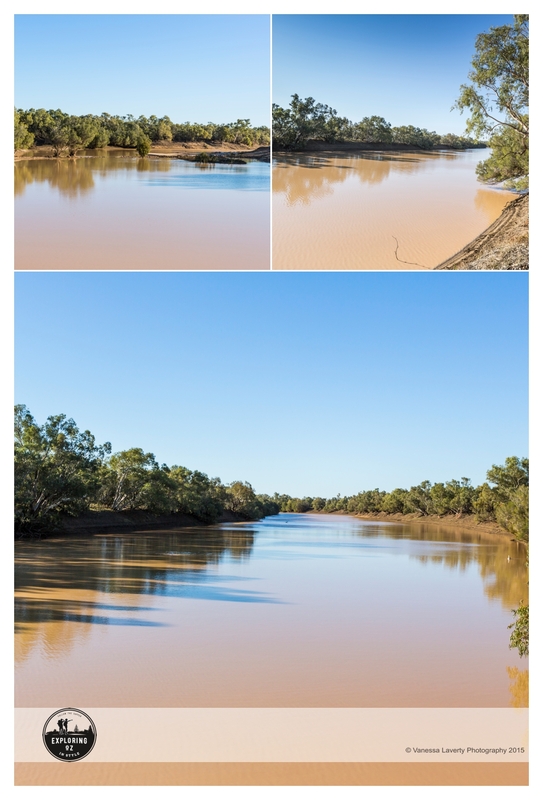 There’s really not much of a choice out here – you either stay at Cooper’s Creek or head further on into Windorah and stay at one of the several caravan parks in town. Totally up to you – all are good options. We are completely self sustainable, so we choose free camping as much as possible. Listed on Wikicamps, this freecamp is a very popular camping spot. 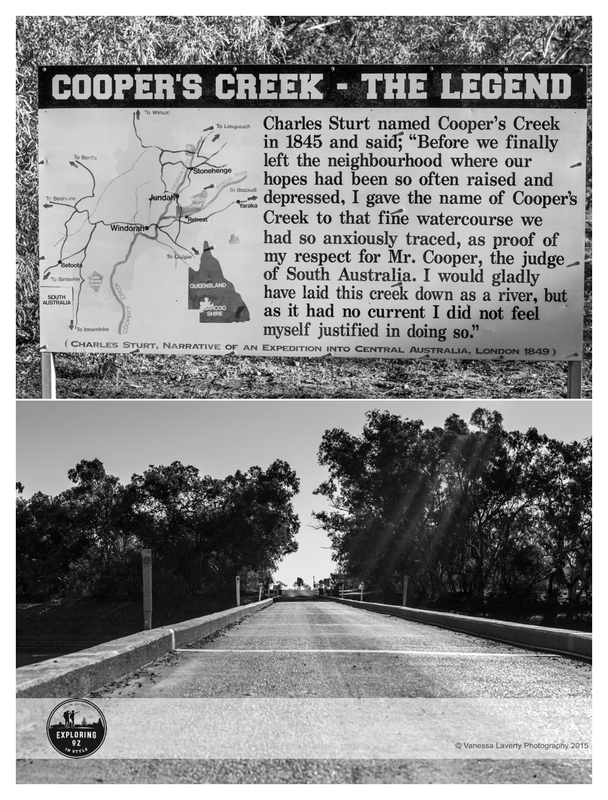 Address: Diamantina Development Road (approx 10km East of Windorah) at Cooper Creek Bridge, Qld. You can park either side of Cooper Creek and it pays to do a drive around before you settle on a spot. It was late in the day when we arrived and as such we took the first spot we saw. It wasn’t til we did a walk around after we set up that we realised you can camp on either side of the creek, either side of the road and that the spots go way up and way down river. There’s loads of space for everyone and you’ll nearly always get a spot to yourself away from others. Council have provided a toilet block (flushing) as well as a few portaloo’s (obviously for the peak season) at the campsite but if you’re self contained, you’re best camping away from it as that’s where everyone seems to congregate. Dogs are allowed, but as we can’t take dogs to the Big Red Bash, we didn’t have any on this trip. Campfires are allowed but BYO wood. We foraged for kindling and fallen logs and it was easy to gather enough for a campfire. During our walk along the river, we spotted a half dozen pelicans who are obviously regulars. They fly in and just relax as they let the current take them downstream to where they can get a feed of fish. We decided to set up the shower for this camp and so enjoyed a lovely hot shower – ahhh the joys of a camper trailer with electric hot water system 🙂 One of the many reasons we love our Aussie Swag. 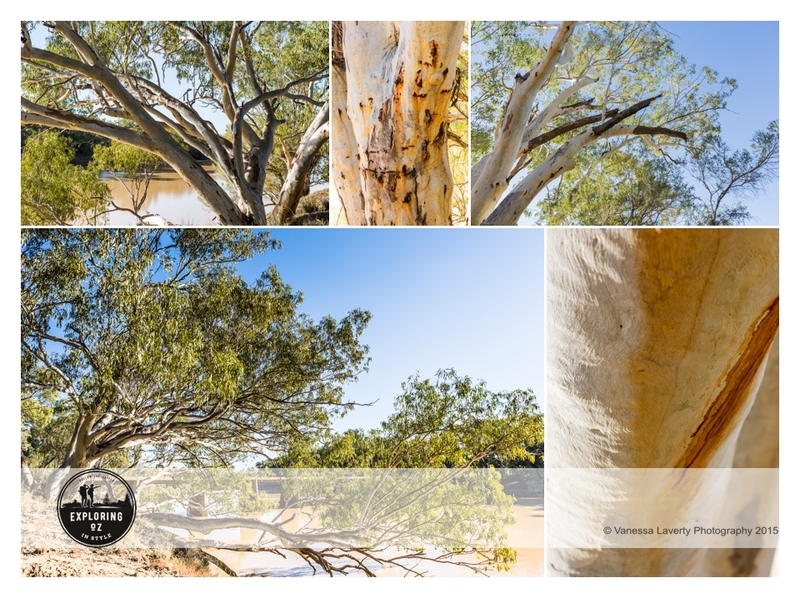 Shower had, fire built, dinner cooked and eaten – time to settle back and enjoy the peacefulness of the outback. 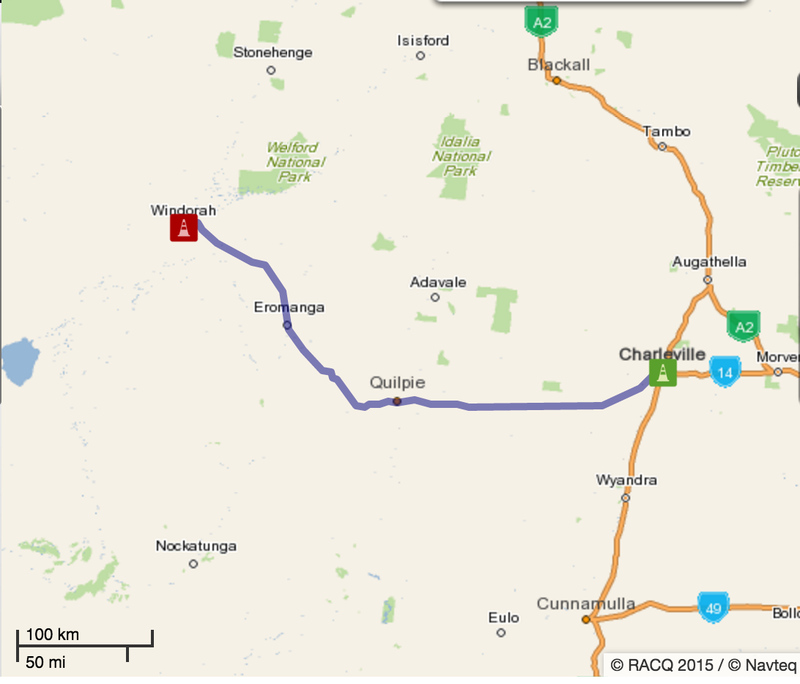 An easy drive today and it appears the time to drive between Quilpie and Windorah is in the middle of the day. We only came across 1 road train and there were few cars. Loved the campsite despite being so busy. Tomorrow, we head to Birdsville and are looking forward to 3 days of camping and music at the Big Red Bash.